[Editor's note: there are three shocking things about this story, not just the alleged violence against the woman]. 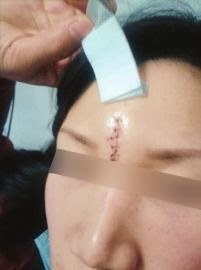 A woman in the Sichuan town of Yibin has needed six stitches for a wound sustained after a fight with a doctor over a dirty cushion. The woman named Chen says she got into an argument with a doctor in the X-ray department after she asked him to swap the cushion on the bench because it had a bloodstain on it. The woman said that she took her 20-month old son to the hospital for a checkup when he had a cough and cold. When she took him into the X-ray room for a scan, she noticed the bloodstain on the cushion and asked the doctor to change it. However, the doctor refused and said "get on with it". When the woman took out some paper towels and started to clean the cushion, she says the doctor disappeared into side room. She admitted she swore at him in frustration and then the doctor came back and swore back at her. The argument erupted and she said the doctor struck her on the head, cutting it open and causing bleeding, for which she needed six stitches. The woman said she was eventually faced with a bill for 3000 yuan in medical costs and she is demanding compensation from the hospital. When the Dr Li was contacted at the Huaxi city Renmin Hospital he gave a different story. he said there were some bloodstains from a traffic accident on the cushion that he had been trying to clean off, but the clinic was extremely busy and he was under a lot of pressure to examine a waiting room full of patients. He said the woman called Li had been in an argumentative and volatile mood and had shouted and swore at him before chasing him into the side room. He said he had not hit the woman but had pushed her away after she started brawling with him, and she had fallen and hit her head. A hospital spokesman said he could not comment on the matter until a police investigation was completed. 1. A dispute over a dirty cushion could result in a violent argument between a female and a male doctor. 2. A woman would take her infant with a minor illness like a cough and cold to a hospital and have the child exposed to high doses of radiation with needless chest X-rays. 3. The medical bill for a cough and cold (and stitches) could be as high as 3000 Yuan.